Your app sends an API request to Zencoder to start an encoding job, along with the location of a video and any optional encoding settings. 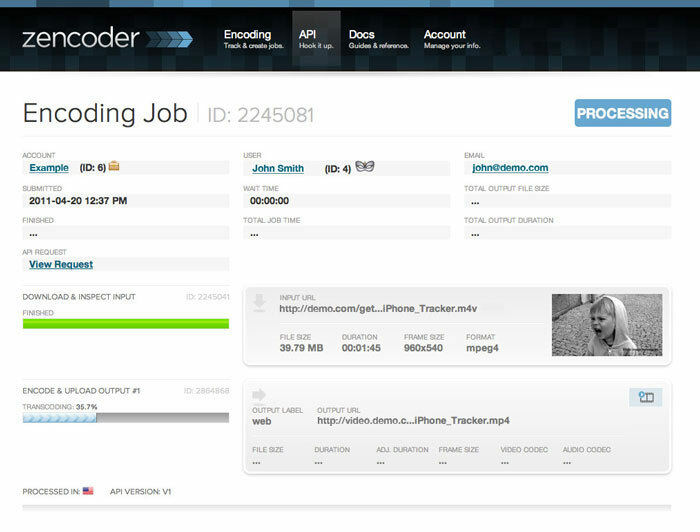 Zencoder responds with an encoding job ID, so you can track the progress of the job. 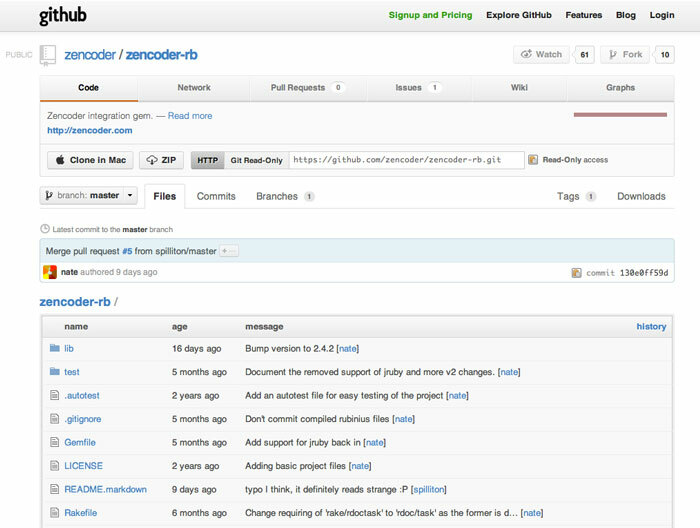 Zencoder downloads the video and converts it to as many formats as you need. Every output is encoded concurrently, with virtually no waiting—whether you do one or one hundred. That's the beauty of the cloud. 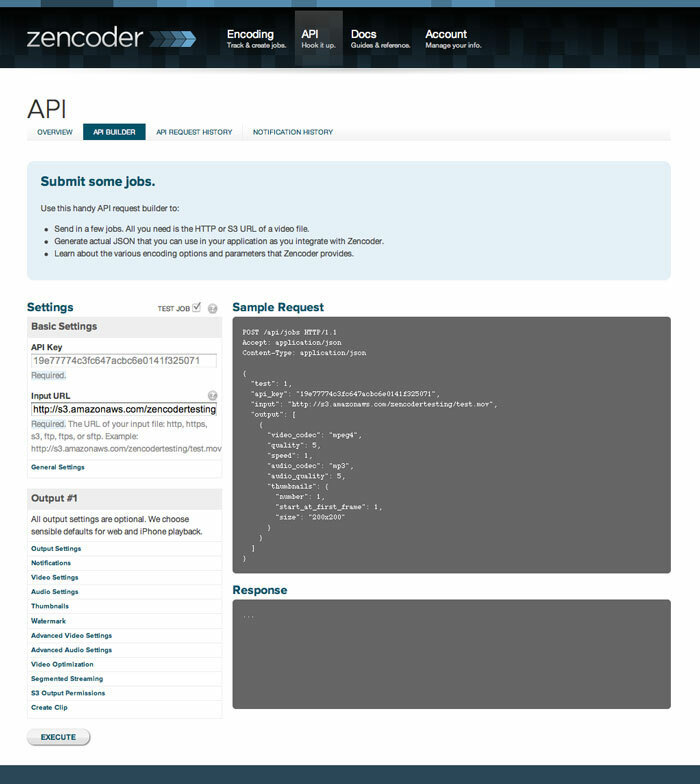 Zencoder then uploads the resulting videos to a server, CDN, cloud storage location, or wherever you dictate in your API call. Zencoder sends a (HTTP) notification to your app letting it know the encoding job is done and your video files have been uploaded. Zencoder's Video Encoding API allows you to seamlessly integrate your application with Zencoder's extremely fast and scalable encoding platform. Our RESTful API is extensively documented with easy-to-use guides and detailed descriptions, as well as thoroughly tested code libraries and code examples for every encoding setting. 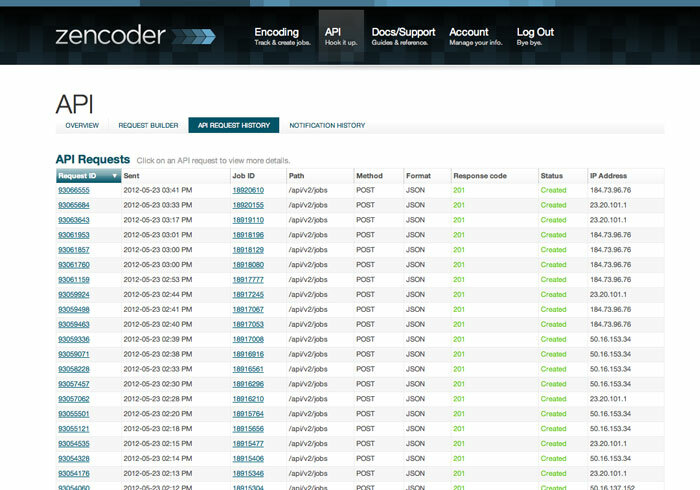 Backed by an uptime SLA and live support with real encoding engineers, integrating with Zencoder couldn’t be easier. What makes a great API? We believe an API should not only be robust in its features, but elegant in its simplicity. Our video encoding API features readable JSON, predictable settings, thorough documentation, and a number of tools to make the integration process even easier. For a complete list of encoding features, check out the Features page. Zencoder supports all the codecs and formats necessary to reach viewers across the variety of web browsers used by consumers today. From Flash to Apple HLS to Microsoft Smooth Streaming, we've got you covered on Firefox, Internet Explorer, Opera, Chrome, and Safari. With a host of video profiles, we make sure that your video looks good in any browser window. Making the transition to HTML5? Zencoder can help you make the transition as painless as possible, with support for H.264, MP4, WebM and Ogg Theora. Need an HTML5 video player? Zencoder is the creator of the most popular free, open source HTML5 video player, VideoJS. Zencoder has the industry-leading solution for HLS, delivering great looking video in smaller file sizes to all the smart phones, tablets and media players that viewers love. Curious about encoding video for segmented streaming? Read more about how to create great looking video in our complete guide to HLS encoding. Deliver segmented HTTP Live Streaming (HLS) content to mobile and streaming devices without re-encoding the video files. Transmuxing packages existing H.264 files into MPEG TS segments at just a quarter of the transcoding cost. Zencoder is committed to providing you a rock-solid infrastructure and we're willing to stand behind it. 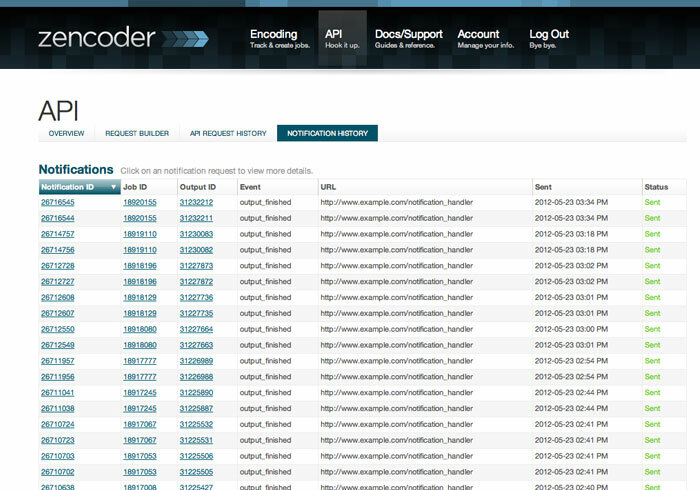 Zencoder guarantees 99.9% uptime and we monitor our uptime using a third-party service. We'll provide a 10% service credit if we don’t meet our goal, plus 10% for every additional 1% of downtime. But the SLA isn’t what motivates us; providing an incredible service is what motivates us. The SLA is just a reflection of our goal. These and hundreds others like them have integrated Zencoder into their video workflow. Read case studies and customer stories on our Customers page.